ON YOUR MARK, GET SET, GO! A RECAP OF THE MARINE CORPS MARATHON - What About Watermelon? 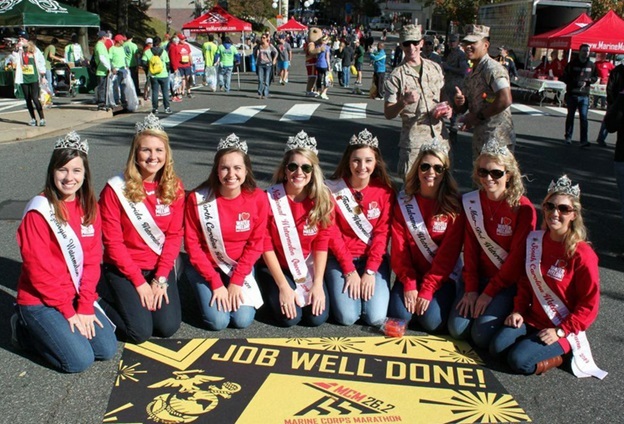 Of all the events on the National Watermelon Promotion Board calendar, one of the biggest (and most fun) is the annual Marine Corps Marathon in Arlington, Virginia. The event — which took place this past weekend — is HUGE, with 30,000 runners converging from all 50 states and more than 50 countries! How big is it? It’s the fifth largest marathon in the United States and the ninth largest in the world. 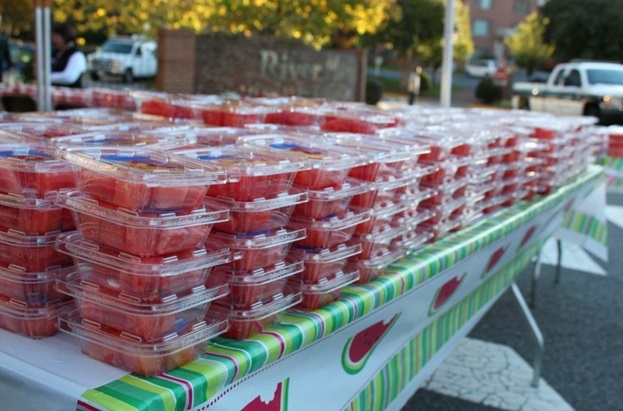 And with that many hungry, thirsty runners (and their proud family and friends), you can imagine the National Watermelon Promotion Board team is pretty busy giving away nearly 50,000 watermelon samples. Yes, you read that right…50,000. That’s a lot of watermelon. Below are a few photos from this year’s marathon. 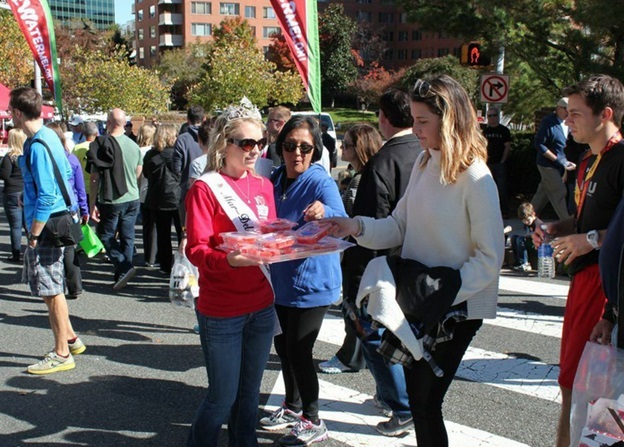 The National Watermelon Queen, Brandi Harrison (left), and the regional watermelon queens descended on the nation’s capital for a little sight-seeing before joining the marathon festivities. The official mascot of the U.S. Marine Corps, Chesty, paid a visit to the National Watermelon Promotion Board booth to meet National Watermelon Queen Brandi Harrison and nibble on a few samples of watermelon. At the marathon finish festival, the watermelon queens and the National Watermelon Promotion Board team gave away more than 10 TONS of watermelon samples (20,000 of the containers you see above) to onlookers and hungry marathon runners. The watermelon queens (here’s Mar-Del Watermelon Queen, Shelby Hurley) took to the streets around the National Watermelon Promotion Board booth to give away watermelon samples to thousands of people. Even J. Slice got in on the action by cheering on the kid’s marathon runners and giving away watermelon samples. 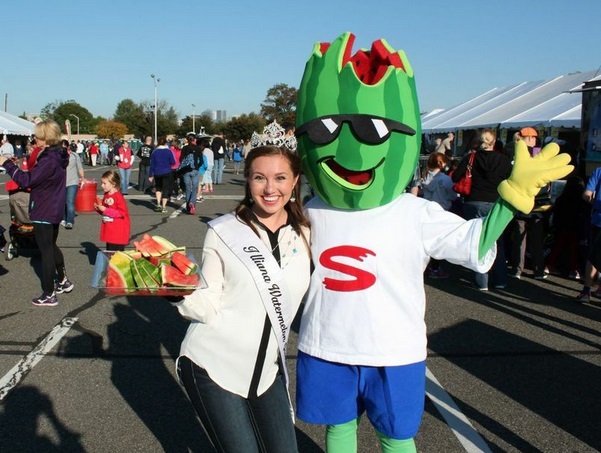 Here he is with Illiana Watermelon Queen, Emily Brown. The National Watermelon Promotion Board team not only gave away LOTS of watermelon, they also participated in the race! 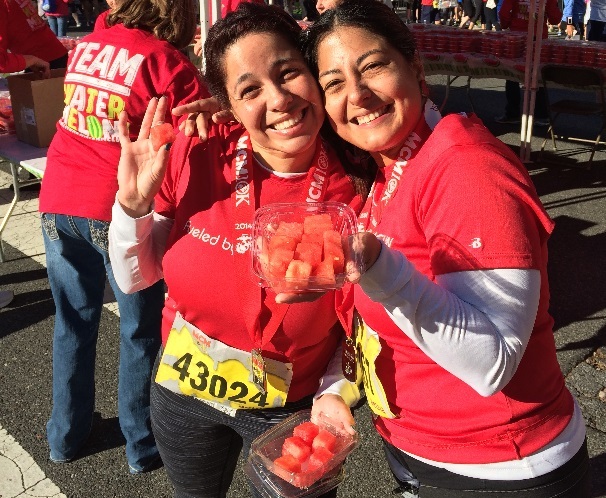 Here’s the National Watermelon Promotion Board’s own Juliemar Rosado (left) and her sister, Melissa Coffey, after finishing the 10K. It was a long day, and a “job well done” by everyone involved, but the 2014 Marine Corps Marathon is officially in the books and we’re already counting down the days until next year’s marathon! WELCOME TO THE WATERMELON HOUSE!